Santos Furniture is a small company that specializes in high quality, well designed unique art furniture, as well as Molesworth reproductions. We are large enough to deliver efficient service, yet small enough to build customized, detailed pieces in which the client can take an interactive role throughout the design process. Santos Furniture designs have appeared in numerous books written by Ralph Kylloe, Elmo Baca, and Chase Ewald. In addition, Santos Furniture has appeared on television shows such as the TODAY Show, and the Home and Garden Network. Lester Santos’ furniture was also showcased in the June 2002 issue of Architectural Digest. Lester bridges and blends many styles together in a way no one else has tried, to achieve a look that is not overbearing, but contains many elements. Components of Adirondack, Shaker, Molesworth, New Mexican, and Native American can all be found in his art. His specialty is in working with interior designers to create custom pieces. Working in the Western Style, Lester Santos' designs are unique and his workmanship is superb. 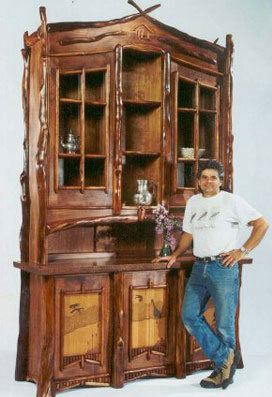 He uses only the finest timbers, meticulously carving each detail by hand. Lester combines wood, leather and his experience to create masterpieces that will last for generations. Fir wood is the material of choice for strength, durability and its grain definition. It was the backbone of the early legendary builders. Cherry wood is used for its strength, beauty and carvability. Juniper wood is used for ornamentation.